Within hours of posting yesterday I had the offer of a roosting box from a local couple who live in the bush just outside town. Jack and Helen are so fond of microbats that they build and hang roosting boxes in the eaves of their house. In the warmer months, they leave their doors and windows open, allowing the bats to race through their house in pursuit of insects. But, there’s been a development… This morning when I went out for my early morning walk, I disturbed an owl. It was sitting on a chair right beside the garden umbrella, and when I looked up into the umbrella … no bats ! 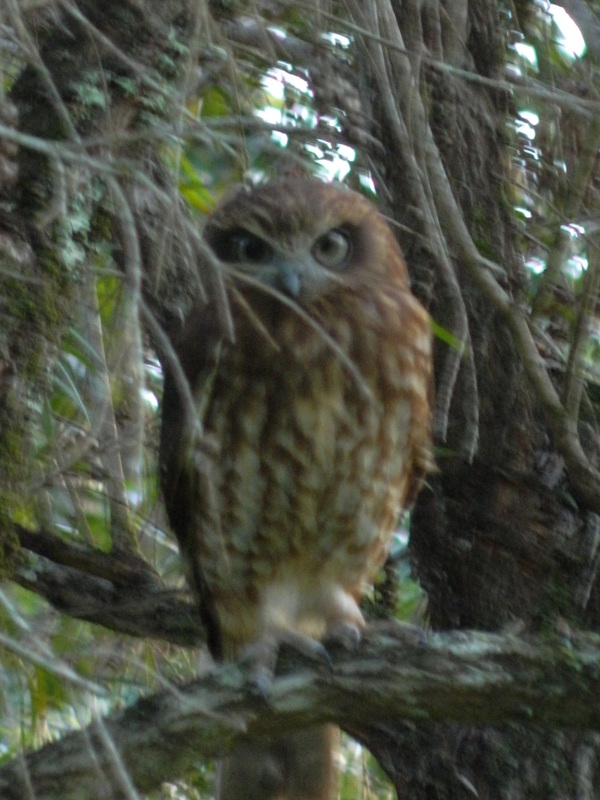 Local ornithologist Richard has confirmed that it’s a Southern Boobook and added the comment “bats actually fly quite slowly, so they are a good prey item for owls” I’m a bit distraught! Jack and Helen did tell me that the microbats move around quite a bit, and that it’s doubtful they would have spent the winter in a flimsy umbrella, so I’ll find a spot for the roosting box and hope that the owl loses interest and that the bats return. Will do David … I intend to hang the box under my eaves within the next couple of days. I’ll take a photo and send it to you asap.